The pretty streets of Pondicherry, dotted with swaying palm trees, bright houses and classy French cafes have recently got a new addition. Pondicherry’s first food truck, the Tasty Truck is big, bold and beautiful in all shades of purple, and has been adding more colour to the already vibrant streets. Started by Rachna Rao and Justine DePenning from Chennai, their menu is inspired by street food from around the world. They have developed the recipes themselves, along with the help of their amazing head chef, V Karthik. They serve tacos (Bira-battered fish and rajma cheddar), Kathi rolls (paneer or chicken tikka), sliders (Korean BBQ beef and smoked eggplant), Thai noodles (shrimp with red pepper and beans with oyster mushrooms) and French fries with a variety of sauces (homemade ketchup, tzatziki, chilly mayo, mustard mayo, satay and pudina). The drinks served here are hibiscus iced tea and a fresh juice of the day. Popsicles will soon be available in collaboration with ‘Truly Scrumptious’ from Chennai, and you can also sample fresh seafood (one of the advantages of being located by the sea). The Tasty Truck lays emphasis on providing healthy options which they try to source from local farms. They will soon start inviting different home-based chefs to do specials every week. The idea behind the food truck is inspired by the duo’s experiences in sampling food from trucks in various cities/events in different parts of the world. The duo was inspired to start their own venture after sampling food from trucks in different places around the world. “The food truck culture globally, in general, tends to be quite an innovative and supportive group of people. 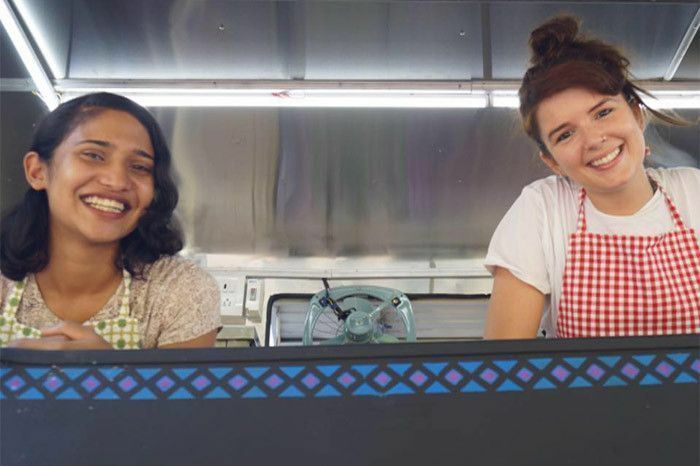 Rachna and I were making meals together frequently and share a passion for delicious home-style food, which evolved into the Tasty Truck project,” says Justine. While their truck manager Shiva takes the control of the wheel, Justine and Rachna share responsibilities equally. Both first timers in the hospitality business, this truck is more than a just a business or a restaurant for them. It’s promoting creativity with cooking, paired with an environmental sensibility. They recycle and do not serve in any plastic; the lighting and the electrical points inside the truck are solar powered with panels placed on the roof. The truck has a cute, vibrant, ribbed exterior design. Talking about the look of the truck, Rachna says, “We spent a long time looking at many different food trucks from around the world and were drawn to the retro design of the Citroen HY van that has a ribbed body. Once we chose the primary colour scheme of the van, and the background painting was completed, we decided to use our van as a canvas and collaborated with an Ooty-based, Goan origin artist called Joyston Christopher Vaz. Joyston who created an incredibly detailed site-specific hand painted artwork.” To set the ambiance, they play their favourite vinyl on a portable record player, with tunes ranging from Nina Simone to Anderson Paak. Food trucks have been a rage in other parts of the country, and it has now started making rounds in Pondicherry as well. “I guess many people have had the idea but haven’t gone through with it due to a lot of legal challenges that food trucks face all over the world,” says Justine. They serve food from 9.00 AM till 9.30 PM, and are getting a lot of happy customers that have made them sell out every single day! Both Rachna and Justine strive to keep up with consistency, aiming to always keep things exciting with their specials. Mumbai’s All Set To Get Its First Ever Food Truck Park!